If we had to sum up Princess' Salty Dog Gastropub, we'd say it's affordable, drool-worthy, high-quality comfort food. The dining experience, which takes over the Wheelhouse Bar on select ships at night, offers everything from popcorn that will make you tipsy to one of our favorite burgers at sea. Even better: the menu was developed by award-winning, Los Angeles-based chef Ernesto Uchimura, so you know you're in good hands. 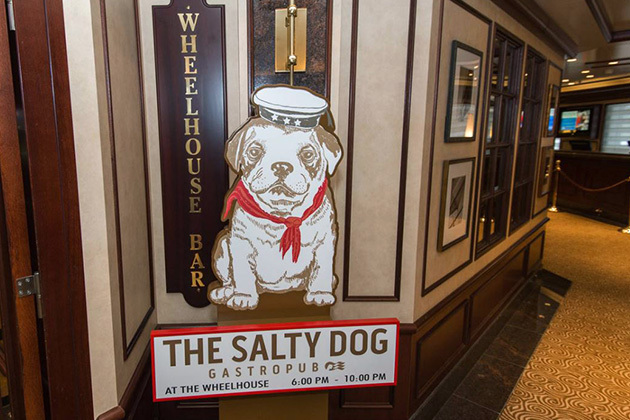 Nothing about the Wheelhouse Bar actually changes when it "transforms" into the Salty Dog Gastropub at night. Passengers can still enjoy the venue's cozy English pub feel, with dim lighting, dark woods, plush leather seating and a nautical theme. There's plenty of space to grab a pint and taste the menu. The Wheelhouse Bar is quite roomy, with a bar and handful of tables (both dining and high-top) surrounding a little stage. Every night, the stage hosts live entertainment such as a piano player or band. 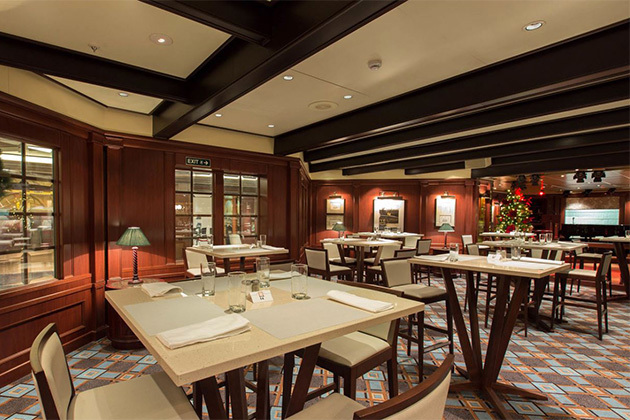 On Royal-class ships, the Wheelhouse Bar is attached to Crown Grill, the line's signature steakhouse. Unlike the more upbeat vibe you'll find in the Crown Grill on these ships, the atmosphere at the Wheelhouse Bar remains fairly tame. Our only gripe is that the Salty Dog Gastropub is too easy to miss for such a worthwhile dining experience. With no dedicated venue and only a small sign to alert passengers to its presence, the Salty Dog doesn't catch the attention of cruisers just passing by. The fixed price includes five dishes: an appetizer, three small-plate entrees and a dessert. 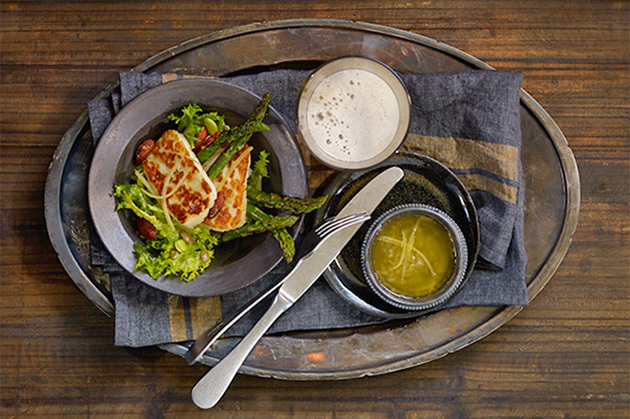 Diners kick off their meal with one set appetizer (always bread sticks with beer-cheddar fondue) then select three main courses and one dessert from a handful of options. Each dish is a popular comfort food with an inventive twist. You'll recognize foods like grilled cheese and cauliflower paired with unique ingredients and think to yourself: "That's interesting; I've got to try that." While the appetizer is the only meal made for sharing, we find that the small plates and desserts round the table just as easily. Entrees are sized as small plates, although we recommend asking your waiter to elaborate on portions as some are heavier than others. 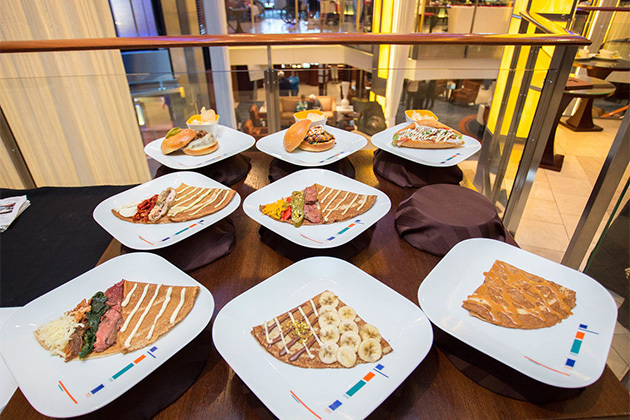 The options include grilled cheese (using emmenthal and gruyere cheeses) with white tomato soup, roasted cauliflower with curry, and spicy beef short ribs with orange blossom honey glaze. All come with fries (truffle-parmesan or sweet potato). Vegetarian items are marked on the menu. The most revered entree is The Ernesto. 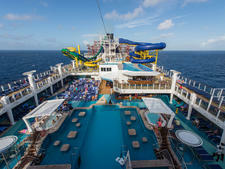 Named after the chef himself, this burger blows all other cruise ship burgers out of the water. It's thick, juicy and everything you'd imagine the perfect burger to be -- only it isn't stuffed with your average ingredients. The burger includes a fresh-ground rib eye and short rib patty, grilled pork belly, cave-aged gruyere, caramelized kimchi, beer-battered jalapeno and charred onion aioli on a smoked salt-and-pepper brioche bun. If you still have room left over, the dessert menu is equally tempting. Passengers can indulge in sweet treats such as a lemon posset with pistachio crunch, coffee and doughnuts (espresso mousse, cinnamon and jelly) and our favorite: bourbon chocolate, salted caramel popcorn. The Salty Dog Gastropub also includes an a la carte drink menu. Handcrafted cocktails range from funky options like the Bloody Derby (spicy or mild bloody mary mix with bourbon and a slice of bacon) to classics such as a Tom Collins or Cosmopolitan. There are also wines by the glass (mostly Californian), beer (craft, international and draught) and cider. The Salty Dog Gastropub's food menu costs $12 per person. Drinks cost extra. 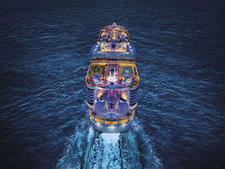 Which ships have The Salty Dog Gastropub? 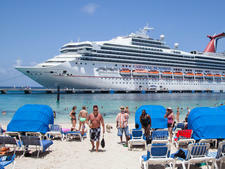 A dedicated venue called the Salty Dog Grill, which serves up complimentary bites, as well as the Ernesto Burger and beer for an extra cost, also can be found on Caribbean Princess' pool deck. 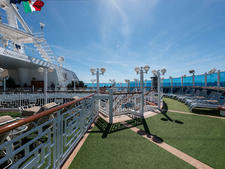 See photos of the Salty Dog Gastopub on Ruby Princess.